Security is a major concern for modern businesses and organisations. Physical or electronic surveillance can provide some of the answers; but how well your building is protected from intrusion will ultimately depend on the quality, precision and performance of your door systems. Our range delivers guaranteed protection to provide you with a line of defence that is the recognised industry leader in timber based security door systems. 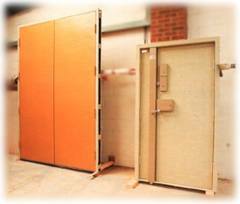 What’s more, Bridgman lBC doors are designed and manufactured to meet your individual needs. That means a solution to match individual site requirements such as size, interior design or aesthetic demands, but one that’s tailored for absolute protection against specific types of attack – from the casual vandal, opportunistic thief, professional criminal or armed assailant. Quality – Bridgman lBC is an ISO 9002 registered company, and all doors and doorsets are manufactured to exacting quality standards. In performance, they meet or exceed all relevant British Standards. Cost-effective – Specify Bridgman IBC doors and doorsets for a complete package that saves time and money. All ironmongery can be expertly fitted in our modern factory environment, and our experienced site engineers are available to install and commission these specialist doorsets with the minimum of disturbance. In-depth technical support – Given the specialist nature of security door system specification, we offer a comprehensive support service to specifiers, architects and contractors. This includes site surveys of customer requirements, avoiding costly specification errors, as well as advice on design and security options. Custom-build – Our extensive manufacturing capability allows us to offer a full custom build service.